All UR Bath bath bombs are hand-made with natural ingredients by our wonderful team of bath bomb artists. 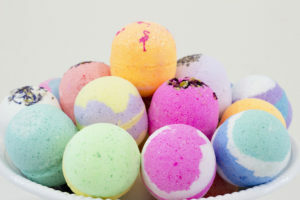 UR bath bombs will draw customers into your shop with their wonderful fragrances and fun, bright colors and since each bomb is 8 ounces or more, your customers will get more for their money and enjoy a longer bath in fizzy fun. We offer a wide variety of scents and colors to keep your customers coming back for more!